Just the recipe you need to help you survive the cold, chilly months! This recipe is vegetarian (if you use vegetable stock), and is so hearty, filling and delicious! Enjoy! Open and drain the can of crushed tomatoes. Open, drain and rinse the cans of cannellini beans. In a large saucepan, add the olive oil and saute the chopped onion for 2 to 3 minutes, then add the minced garlic and saute for 1 more minute. Stir in the chopped spinach, crushed tomatoes, tomato paste, cannellini beans and chicken stock. Bring to bubbling. Once bubbling, add the tortellini and cook for 3 to 5 minutes, stirring once. Remove from heat immediately and serve. Season with salt and pepper to taste. 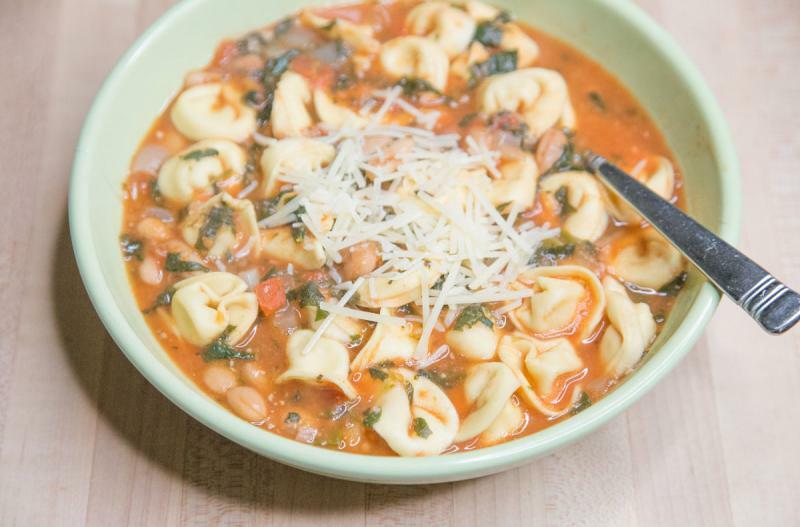 Serve White Bean Tortellini Soup with Parmesan cheese garnish and salad. Chop 2 small white onions. Open and drain 2 cans of crushed tomatoes. Open, drain and rinse 4 cans of cannellini beans. Do NOT add the chicken stock before freezing. Put baggie in the freezer and freeze up to 6 months in fridge freezer or 12 months in a deep freezer. Thaw in the fridge overnight, or a warm bowl of water for about 20 minutes, before transferring all of the contents of the baggie into large saucepan or Dutch oven. Add the chicken stock and bring to bubbling. Then add the tortellini and cook for 3 to 5 minutes. Serve immediately. Make vegetarian version by using vegetable stock. Unfortunately, there isn’t a great dairy-free option for this meal. Unfortunately, there isn’t a great gluten-free option for this meal. Thaw and add contents of baggie to large saucepan or Dutch oven and add the chicken stock. Bring to bubbling and then add the tortellini and cook for 3 to 5 minutes, serve immediately.